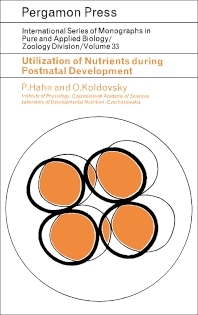 Utilization of Nutrients during Postnatal Development investigates the nutritional aspects of postnatal development, with emphasis on functions that in some way are closely connected to food, including food intake, digestion, transport, and metabolism. Topics covered range from energy sources and energy balance in starvation to the quantitative and qualitative aspects of food intake. The fate of carbohydrates in infant animals is also discussed, along with the metabolism of lipids during postnatal development. Comprised of eight chapters, this volume begins with an analysis of the most important differences between adult and suckling rats, paying particular attention to thermoregulation and the action of hormones in the early postnatal period. Subsequent chapters deal with the effect of starvation at two environmental temperatures on losses in body weight; protein as an energy source; the absorption of glucose from the gastrointestinal tract; and energy metabolism in the human fetus and newborn. The final chapter is devoted to the late effects of changes in diet composition during the weaning period. This book will be useful for students, practitioners, and researchers in physiology, biology, and developmental nutrition.